Spring migration of Ruby-throated Hummingbirds (Archilochus colubris) begins around the last week of March in the northcentral Piedmont of South Carolina; in autumn, ruby-throats begin departing for Central America in early August and the last of them are gone by mid-October. As part of "Operation RubyThroat: The Hummingbird Project," Bill Hilton Jr. has been banding hummingbirds since 1984 at Hilton Pond Center for Piedmont Natural History near York SC (just southwest of Charlotte NC). 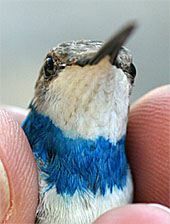 Although the Piedmont seems NOT to be a hummingbird migrational pathway or staging area, through 2011 Hilton still managed to capture and band nearly 4,500 Ruby-throated Hummingbirds (RTHUs), and he retrapped many of them in subsequent years after banding. To minimize recapture of banded hummingbirds in his pull-string and electronic traps, Hilton is authorized by the federal Bird Banding Lab to mark each bird from York with non-toxic GREEN dye on the upper breast and throat. (In fact, he uses a so-called "permanent" felt-tip marker, but the dye wears or washes off within a month or so.) In addition, Hilton bands ruby-throats each winter in Guanacaste Province, Costa Rica and marks them with BLUE dye (below left). RTHU banded in Belize get PURPLE dye, those in Guatemala get BLACK. Because we know little about actual overland migrational pathways for hummingbirds, observers are asked to report any sightings they may have of these color-marked hummingbirds during spring and fall migration and during the summer breeding season. 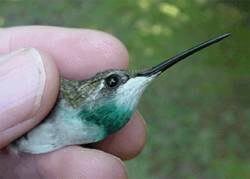 Color-marking of RTHUs at Hilton Pond Center paid off in October 1991 when a woman in Atlanta saw an "unusual" hummingbird with a green throat and called Bob Sargent, a fellow hummingbird bander from Alabama. Bob went to Atlanta, trapped the bird, and after reading the band number learned it had been banded in South Carolina at Hilton Pond Center just 10 days before. This was the first banded RTHU ever to be recaptured and released more than 10 miles away from its original banding site. In Fall 1997, Judy Fruge of Cameron in southwestern Louisiana sighted another "green-throated" hummingbird that was likely a RTHU banded at Hilton Pond Center. This bird may also have been the first "long-distance" sighting of a color-marked RTHU. Another green-marked bird was seen in September 1999 east of Charlotte, North Carolina, about 30 miles from Hilton Pond Center. The furthest recapture of a color-marked hummer from Hilton Pond Center was by banders Fred Bassett and Fred Moore in Robertsdale, Alabama (near Mobile) on 20 Oct 2000. The bird had been banded 17 days earlier (3 Oct) at York. This and the other sightings mentioned above further support the idea that at least some East Coast RTHUs migrate not to south Florida but to the Texas Gulf Coast before a trans-Gulf (or Mexican overland) crossing. If you see a color-marked hummer, do not attempt to trap it (it's against federal law to do so unless you have a special permit), but please immediately contact Operation RubyThroat and Bill Hilton Jr. via e-mail at RESEARCH or by phone at (803) 684-5852. If you find a dead banded bird, read the band number and contact both Operation RubyThroat and the federal Bird Banding Lab at 1-800-327-BAND or via their reporting Web site page at http://www.pwrc.usgs.gov/bbl/. Thank you for any help you can provide in taking close looks at hummingbirds at your feeders, and please pass this information to other persons who might be interested--especially newspapers and TV stations that can help spread the word. 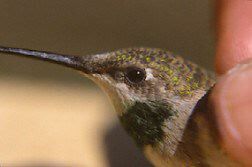 A wealth of information about hummingbirds is available at the Web site for Operation RubyThroat: http://www.rubythroat.org, and at the website for Hilton Pond Center: http://www.hiltonpond.org.